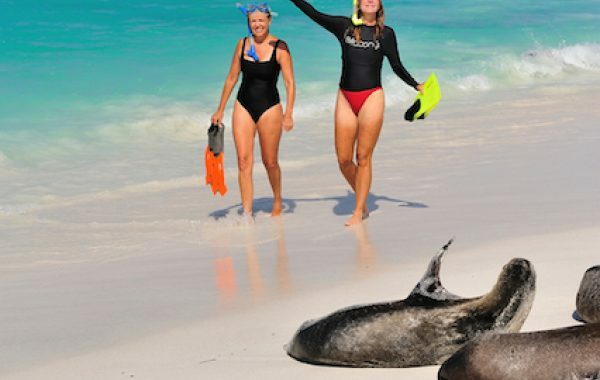 A cruise of the Galapagos Islands is one of the world's greatest nature experiences. Nowhere else on earth will you find such a diversity of flora and fauna; a living museum to natural history and the magic of life itself. This five-day cruise takes you on a tour of the islands' absolute best highlights aboard a deluxe expedition yacht with expert guides to help you explore this unique place. This itinerary can be customised on request. A Lost World Adventures advisor will be happy to help – get in touch for more information. Arriving from either Quito or Guayaquil, you'll be met at Baltra airport by a Lost World Adventures guide and make the short drive to the pier to board your yacht. You'll be greeted with a welcome cocktail, shown to your berth and given an orientation of the yacht and the on-board facilities. 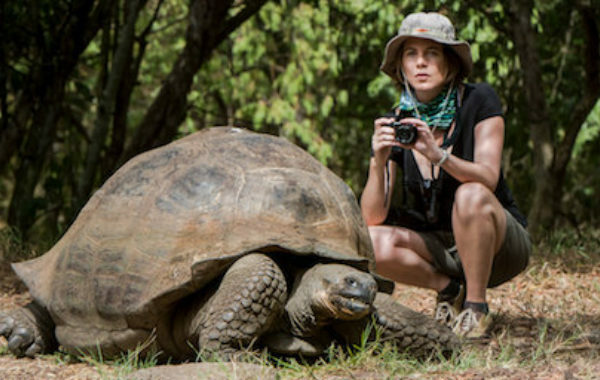 After a brief cruise from Baltra to Santa Cruz island you'll disembark for a walk to visit one of the Galapagos' most famous residents: the giant tortoise. As you walk through dramatic scenery of sinkholes and endemic forests, your guide will help you spot several species of the islands' finches (of Charles Darwin fame). Return to the yacht to take a dip in the jacuzzi, enjoy a delicious evening meal and get to know your fellow passengers in the social areas. Five days about either the Coral I or Coral II, small cruise yachts with a maximum of 36 passengers. Both yachts are fully air-conditioned, with private bathrooms, two terraces, a dining area, lounge, library, and a jacuzzi. This is a spectacular site, surrounded by immense cliffs of an eroded volcano which bristle with seabirds such as brown noddies and Nazca boobies. Taking a dinghy you'll approach the birds for an up-close view, and also have the option for some snorkelling to witness some of the abundant marine life under the waves. 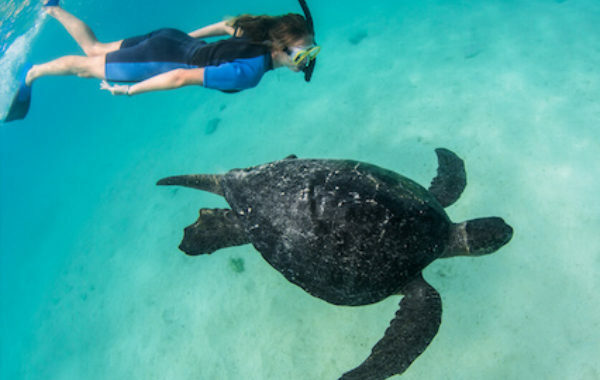 You might find yourself swimming alongside penguins and green turtles! After lunch you'll make a dry landing at Punta Espinosa on Fernandina, the youngest of the islands and therefore one of the most pristine ecosystems anywhere on earth. 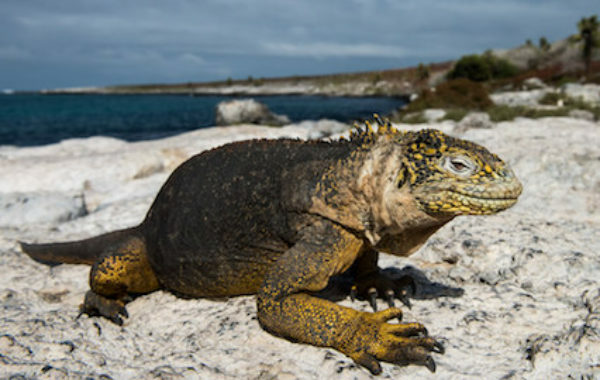 Fernandina is the marine iguana capital of the world. This desolate volcanic backdrop is home to a huge concentration of these enigmatic reptiles incongruously sharing the shoreline with the diminutive Galapagos penguins. You'll also have the chance to snorkel with marine iguanas feeding underwater, penguins, turtles and the endemic flightless cormorants. Time to get your feet wet! You'll make a wet landing at Urbina Bay for a hike to Alcedo Volcano, passing large blocks of coral that were exposed by a dramatic geological uplift, and keeping an eye out for the land iguanas and giant tortoises that live on the island. Following lunch you'll make a dry landing at Tagus Cove, w well-known hideout and deep water anchorage in the days of pirates. Tagus Cove was also one of the few sites visited by Charles Darwin and HMS Beagle in 1835. You'll enjoy a beautiful hike with views of Darwin Lake and Isabela Island's dramatic volcanic landscape. Once back at sea level you can snorkel or kayak among the turtles, fish, penguins and flightless cormorants. The black volcanic sand sets this landing apart from most. It's best known for the dramatic shoreline which provides a habitat for colonies of fur seals, sea lions, lava lizards, Galapagos hawks, and many others. An optional visit takes us to an abandoned salt mine famous in its day for supplying salt to mainland Ecuador. Sullivan Bay enthrals visitors with its amazing beds of pahoehoe lava, making it a photographer's dream. As you hike over the lava your guide will explain the importance of pioneer plants, and you'll finish the excursion with another chance to snorkel among the sea lions, turtles and rays. Named for some wrecked World War II barges whose ribs are still visible in the sand, this site offers great swimming, a lovely walk along the shore and a visit to a lagoon behind the high tide line with wading birds, marine iguanas and sometimes even flamingoes. The two beaches are also favourite nesting sites for green turtles which often leave tractor-like tracks in the sand. After lunch you'll wave goodbye to your guides, crew and fellow passengers, with whom you've undoubtedly become firm friends, and make the trip back to Baltra airport and your onward connection to Quito or Guayaquil. From here you can continue to explore Ecuador, or make the short connection to Peru. Contact a Lost World Adventures travel advisor who will be happy to customise your itinerary. My 12 family members aged 7 to 71 enjoyed the trip immensely. We especially enjoyed Espanola and Floreena. The wildlife and views on these islands were wonderful. Snorkelling with sharks at Kicker Rock, our walk on Espanola seeing mating blue footed boobies with their high stepped walk, whales from the beautiful rocks, Albatrosses mates clicking their beaks. We just got back from the most amazing family vacation in Ecuador. 14 of us, including 2 children and 2 teens, went to Quito and the Galapagos Islands. The trip went off without a hitch, and everything was so well planned. The Galapagos ship was beautiful, and all the staff was incredibly helpful and friendly. Our room and huge windows looking out to the beautiful islands. The rooms also had a lot of storage for all of our stuff. We had a wonderful time and Lost World Adventures put together and fantastic trip! I went on a two-week Ecuador and Galapagos vacation with Lost World Adventures in October 2015. My prime memory is the smoothness of the trip; every detail was planned and delivered with the utmost professionalism, meaning we could simply sit back and enjoy the country. Not only did the itinerary reflect my hopes for the trip, it was full of surprises and little touches that helped to elevate it every day. In particular, the choice of hotels was outstanding and the guides were incredibly inspiring with their knowledge and passion. What started as an idea (visit Ecuador and Galapagos) was crafted into something I could never have imagined in advance. 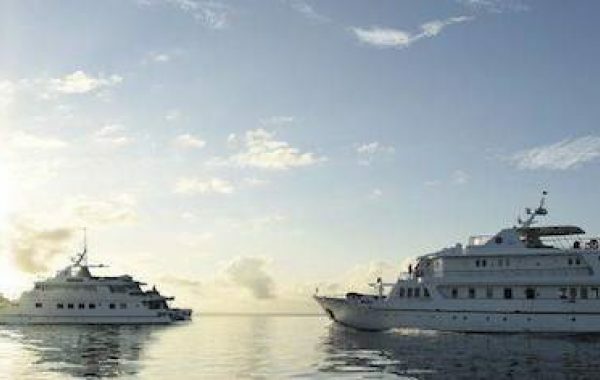 Five days / four nights full board on the M/Y Coral I or Coral II. Each cabin includes safe, entertainment system with LCD TVs, hair dryer and deluxe bedding. Multilingual expert naturalist guides aboard the yacht and at every excursion. Galapagos Entrance Tax and Transit Control Card are not included but can be arranged in advance. Full board meals on the yacht, serving delicious, freshly-prepared Ecuadorian and international cuisine, including an open-air BBQ on the Moon Deck. All transfers and connections in the Galapagos Islands.